Sudbury, ON (December 11, 2015) – Canada’s Ultra-Deep Mining Network (UDMN) continues to make strides in solving the challenges that impact resource extraction in ultra-deep (below 2.5km) environments launching new Call for Proposals and Network Members share the stage highlighting their innovative solutions and commercially viable products. The $46 million NCE business-led network, now in its 2nd year of operation, has become the leading expert in ultra-deep (below 2.5km) research and innovation. Under the management of CEMI – Centre for Excellence in Mining Innovation, and key involvement from industry leaders, the UDMN currently manage 24 active projects in 4 strategic themes (Rock Stress Risk Reduction, Energy Reduction, Material Transport and Productivity and Improved Human Health and Effectiveness). These projects aim to amplify and expedite commercial value and enhance ultra-deep mining innovations in Canada and beyond. 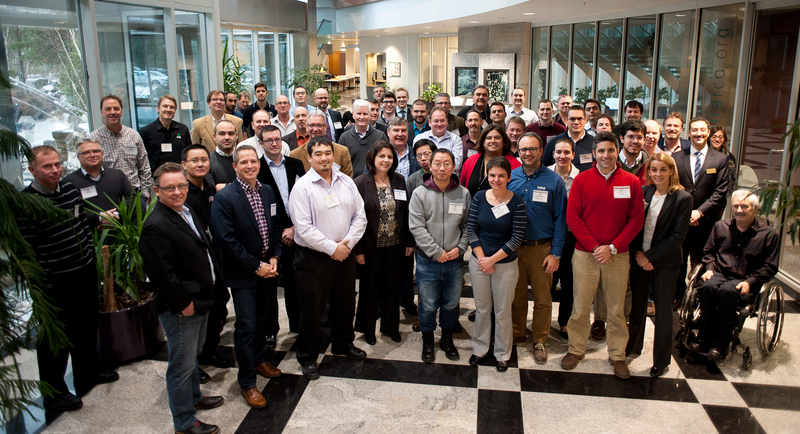 With collaborative and dedicated networked solution teams consisting of leading experts from the mining and oil & gas industries, small-to-medium sized enterprises, industry agencies, research facilities and academia, the UDMN has grown to include 44 Network Members from across Canada. This includes representation from the three deepest mines in Canada, including Kidd Mine owned by Kidd Operations, A Glencore Company, Creighton Mine owned by Vale and LaRonde mine owned by Agnico Eagle Mines. On December 1, 2015, network members participated in the 1st annual UDMN Symposium. This event provided members with an invaluable opportunity to engage with all network members; present high level project summaries; network with mining companies; and identify other potential synergies. An industry led panel was assembled to facilitate discussion on technology trends affecting the mining industry today and on how mines implement new technologies. Panelists included: Zachary Mayer (Manager, Mine Technical Services) at Kidd Operations, A Glencore Company, Steve Runnalls (Manager, Mines Technical Services) at Vale, Ontario Operations, Shayne Wisniewski (General Manager of Mining Projects) at Sudbury Integrated Nickel Operations, A Glencore Company, Douglas Morrison (President and CEO) at CEMI and moderated Roger Emdin (Vice President of Projects) at Harte Gold. UDMN members were given the opportunity to ask questions and debate issues, including pressing technological problems facing the deep underground mining industry; challenges in access to mine sites and industry support; change management in mine operations; and the types of return on investment that industry prioritizes. Engaging mining companies continues to be a priority for the network. Following a successful Call for Proposals in 2014 that prioritized small and medium enterprises, suppliers, academia, research institutes and original equipment manufacturers, a 2015 Call for Proposals (CFP) has been issued to mining companies who are current members of the UDMN Industry Consultation Group. The CFP has two main drivers; to ensure Network projects are aligned with problems facing industry, and the chance to increase the level of collaboration between mining companies and other network members.